We are so happy you’re loving the templates. But unfortunately… Many people have broken the templates already twice in less than 24 hours. Please follow the steps in the tutorial very carefully. You will need to Make a Copy of the templates first. Do not edit OUR templates. If you do not make a copy of the templates, you will break the templates for everyone. We created these templates for free for everyone. If people keep breaking the templates, we will stop sharing the templates. The tutorial is SO easy, too easy. So easy that it’s easy to break the templates. Just follow the steps, ok? Make your own COPY of the templates. An Instagram Puzzle Feed is one of our favorite Instagram feed layouts. It looks complicated to create, but it’s actually super simple. 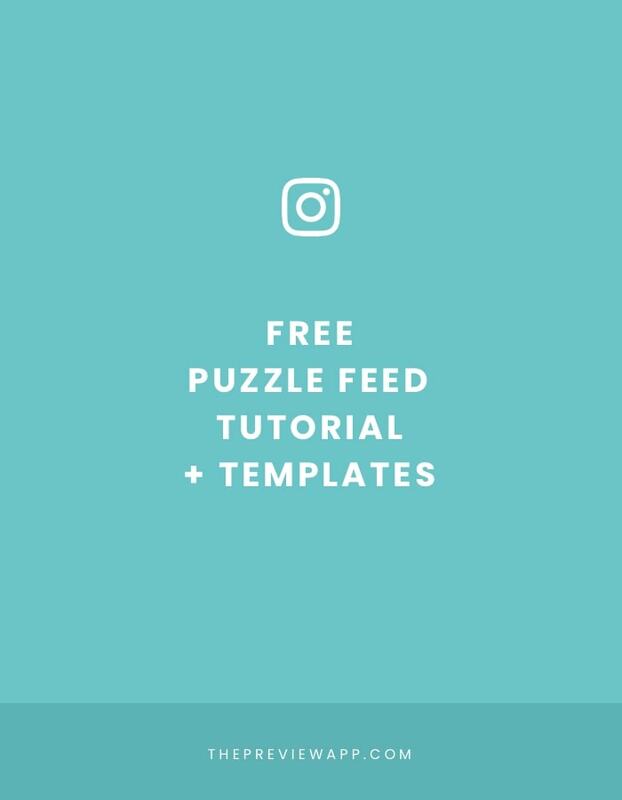 And to make it even simpler, we created 6 beautiful Instagram Puzzle Feed templates for you. Please read the tutorial very carefully. We are making the templates free for everyone, all around the world. We want to make sure nobody breaks the templates. So please, follow this tutorial carefully. The tutorial is super easy. Canva is a very simple design tool. It has a website and an app. To keep things super simple, I recommend you use Canva on your computer (not the app). It will be easier to create your puzzle feed on your computer. If you don’t have an account with Canva yet, click here to create one. If you already have one, login now. Then, go to step 2. Before I share the link to the templates, read the full tutorial. We made the templates available to everyone for FREE. We need to make sure nobody breaks the templates. If people keep breaking the templates, then we will stop sharing the templates. After you click on the link, the Canva website will open and you will see the templates file. Click on “Make a copy”. A new window might appear on your computer. This is your official copy of the template: your template. To make sure you have the copy of the template, look at the file name. You should read “Copy of Puzzle Feed”. If you don’t see the file name “Copy of Puzzle feed” but just “Puzzle Feed”, go to step 5. Click “Home”. You will be taken back to your home page in Canva. Under your “Designs” you will see the “Copy Puzzle Feed”. Once you have made a copy of the templates, you can edit your copy. It’s yours! Choose one of the 6 templates. Once you are happy with the look of your Puzzle Feed, it’s time to save it. To download your Puzzle Feed, press on the “save” button, on the top right corner of your screen. Tip: Check what page your Instagram Puzzle Feed is on. For example, “Template 6: Arty” is on page 18. Select the exact page you need to download. Now you need to split your big image into grids. Then press the “Split image” button at the bottom of your screen. Save each image individually (to save the image, just click on each button). Final step: build your final Instagram Puzzle Feed in your Preview app. Now that you have each single image, it’s time to recreate your beautiful Instagram Puzzle feed and see it in action, as if they were already posted on Instagram. Preview allows you to see how your feed will exactly look like before you post on Instagram. Sounds good? Let’s do it. Use Dropbox or Google Drive then save the photos on your phone. Choose your favorite way. Then just upload these photos in your Preview app. Don’t worry about the order in which you upload your puzzle feed photos in Preview. You can rearrange the order of your posts once they are in the app. Just drag and drop them around until to recreate your beautiful feed. This will ensure you are editing YOUR OWN COPY of the templates. If you have any doubts or questions, please ask us first. Click here to get the templates. It literally takes me 10 minutes to create a puzzle feed from start to finish using the template and then uploading the posts in Preview. We would love to see your creations! Tag us in your posts or Insta Story so we can re-share your beautiful Puzzle Feed.